A Study in Emerald is based on a Neil Gaiman short story (basically a mash-up of Cthulhu and Sherlock Holmes) and as such, seems to have some of the flavor from the story. It is at its heart both a hidden role game (one side is the Loyalist who want to maintain the status quo and the other side is the Restorationist, who are trying to get rid of the reign of the Old Ones and bring back monarchy) and a deck building game. By doing various actions, the players will be able to get a better deck of card which will allow them to score point. At the game end, all the players on the side with the lowest score lose. The player on the winning side who has the highest score wins the game. The combination of hidden roles and deck building is very very intriguing but I’m somewhat scared of explaining the game. It’s seems tricky to understand, thus my wanting to make sure I’ve got the right group to play it. Also, it seems to work much better with 5 players, a number which is not easy to get around the table. 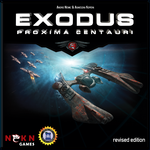 Exodus: Proxima Centauri (NSKN Games) by Agnieszka Kopera and Andrei Novac: a pretty cool looking 4X game (eXpand, eXploit, eXplore and eXterminate) with a political phase and a twist on the classic action selection mechanic: players have set of action cards that are divided into 2 sections; everyone selects 1 card and reveals at the same time; players then enact the top action on their card; once everyone is done, they all select an action on the lower half of ANY card. So not only do you not know what other players will select, but there’s a strong chance that you’ll offer someone else something really good. Players can also choose to act on the Action card selected during the previous Political phase, for even more fun. So far so good, could easily lead to lots of manipulation and diplomacy. Why hasn’t it hit the table yet? Well, it’s a fairly long game (listed at 3hr), with a long rules explanation, but that hasn’t stopped me before. No, what really scares (and intrigue) me is the WMD. Yup, Weapons of Mass Destruction. It is possible, through research, to gain some WMD towards the end of the game and use them to destroy other players’ planets. Since planets are what scores you points at the end of the game (the game end is triggered by having played 7 turns), they are important to keep. I’m just slightly worried that the WMD are too important and could unbalance the game. Still, I really want to try this and will have to set a full day aside for it. For the Crown (Second edition) (Victory Point Games) by Jeremy Lennert: ok, give this idea a chance to sink in: what if we combined chess with a deck-building. I know it sounds crazy, but this game apparently works and it is very interesting (to the point of having not one but two expansions). There are a lot of new pieces added to the mix, but at its core, it’s good old chess. Capture the other player’s king and you win. The challenge, like any deck-building game, is to know when to switch from card acquisition to exchanging those cards for pieces on the board. It all sounds very fascinating and looks fairly easy to teach (plus everyone knows chess, so that part is pretty simple to teach). Greenland (Sierra Madre Games) by Phil Eklund and Philipp Klarmann: Love ’em or hate ’em, games by Phil Eklund always get an extreme reaction. Seen as too complex by many (the term simulations is often used), they are indeed more precise, less gamey than most other games. And they often have rulebooks that are really hard to grasp at first read. It was the case with the last one (the nonetheless excellent Pax Porfiriana), which had as many rules in the lexicon as in the main rulebook and is unfortunately still the case here, despite being much better. 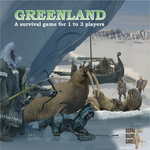 Greenland is a 3 player game, with players taking on the role of the Thules, the Tunit or the Norse in a contest to see who can survive the Little Ice Age. At its core, it is a worker placement game where the players assign cubes to hunt, become Elders, go on livestock raids or Sabine raids (steal womenfolks from other tribes). Hunting is very important because not only can it bring you extra hunters, but it can gain you Wood, Ivory or Steel as well as Trophies (VPs). Depending on how things go, you can even go from a polytheistic tribe to a monotheistic tribe, changing your victory conditions. It looks fascinating, with a healthy dose of luck (you need to roll 1s or 2s to successfully hunt) which can be mitigated by having the right daughters/being married to the right wife and getting the right equipment cards. The game is apparently brutal, with the first few games ending with no one winning (the game can wipe out all your hunters as the Ice Age comes down). It is much more straightforward than it would first appear. Why hasn’t this hit the table yet? Timing and the game is really a 3 player game, which makes it a little harder to bring to the Ubi group. Legacy: Gears of Time (Floodgate Games) by Ben Harkins: Time travelling games are a strange breed. While I can’t name more than 2 or 3 (one of which is lower down on this list), there seems to be a lot more than would appear at first. Most of them must be forgettable, but at least this one looks really neat with mechanics that look to blend well with the theme. While the game isn’t much to look at at first (sorry, but that’s one of the worst cover I’ve seen…), the game seems solid. In Legacy: Gears of Time, the players take on the role of time travelers, going back in time and trying to score points by discovering technologies before the other players. One of the core ideas is that you can only move backwards in time, which means you need to be careful what technology you play since all techs needed to play a new tech must be in play for it to score. Also, if someone else manages to play the same tech as you but earlier, your version of the tech will be removed since it has already been discovered. Why hasn’t it hit the table yet? Well, the cover doesn’t help and there always seems to be something that just came out that might be easier to play/explain (although this doesn’t seem all that complex, really). I really need to just push a little more. Paperback (Self-published) by Tim Fowers: a deck-building word game. Yup, finally someone’s made a decent competitor to the venerable Scrabble and a game that’s relatively easy to explain and understand. I picked this up when it was up on Kickstarter a few years ago and while I tried out a game with my wife using the print-and-play version, I’ve yet to get it to the table. The core of the idea behind Paperback is exactly what I had stated earlier: every player starts with their own deck of cards, with which they will try and create new words in order to purchase new cards, which will give them additional letters with which to make larger words. The aim is to pick up as many Fame points as possible, some of which are simply cards that give Fame points. Why hasn’t it hit the table yet? Time and group, really. Word games are a very acquired taste (most gamers I know would rather play with meeples than with letters) and it’s hard to find the right group. As far as complexity, it’s actually easier to explain/understand than Dominion, which it shares many traits with. Ruhrschifffahrt 1769-1890 (Spielworxx) by Thomas Spitzer: I love heavy games and even more heavy game with a non-traditional historical theme. Yes, I have a bunch of games on trading in the Mediterranean during the middle-ages, but if you want to really get my attention, bring me a game about a less-known subject (Greenland, above is a good example and so is the whole 18XX family). So when this game showed up on Kickstarter, it had my attention right away. After all, how many games do you know of about the transport of Coal up the Ruhr river in the 18th and 19th century? In Ruhrschifffahrt 1769-1890, players take on the roles of barge captains as they attempt to move coal from one end of the river to the other. Of course, this is much easier said than done and where you pick up and when you drop said coal plays a major role in whether you’ll have a chance of winning the game or not. There are some aspects which are reminiscent of the excellent Panamax, with dice (black and white) playing a major part on when/how you can deliver your load. Haspelknecht, coming out next year. 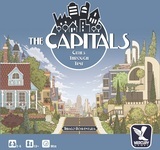 The Capitals (Mercury Games) by Thiago Boaventura: There is something about a good management game, and combining a city building game with a management game seems like a stroke of genius. There has been many city building games (including the superb Sunrise City, which I need to bring back to the table), but not so many management games. The Capitals seems to fill that niche of nice, meaty management games combined with the satisfaction of seeing your city develop through nice thick tiles. In The Capitals, players compete to bring attention to their city by building it up, getting the infrastructure right, attracting more tourists by making sure they have the most Culture. Keeping workers employed also helps make your city more attractive. The main mechanic is that of tile drafting and placement to build up your city, along with tile activation which will trigger various effects. Why hasn’t it hit the table? It’s really about the terrible rulebook and the length of time needed to explain. I really want to get it to the table soon however. The Great Fire of London 1666 (Pandasaurus Games) by Richard Denning: I love a game that’s centered around a historical event, even more when it is from an event that hasn’t been covered a thousand time and if there’s an event that should have even more games made of it is The Great Fire of London, which burnt down most of the city. It caused the city to be transformed, with the old wooden buildings being replaced partially by stone buildings and left a scar on the city which you can still see to this day. Maybe someone will make this into a series of game, with each installment covering another city which was razed by a great fire (many more cities than would appear at first). In The Great Fire of London 1666, the players take on the roles of competing wealthy men who are trying to take advantage of the fire raging through their cities. By guiding the spread of the fire as well as directing the different fire brigades, they are trying to burn down buildings owned by other players while saving their own and attempt to come across as the city’s hero by saving as much of the city as possible. Of course, no one knows who owns what, so attempting to save your buildings without tipping your hand is important, since you might become the prime target for other players. The game is gorgeous to look at, with wooden cones representing the fire and a beautiful map. Rules-wise, it’s not too hard to grasp, with perhaps the fire propagation rules being the more difficult aspect to understand. Why hasn’t it hit the table? Honestly, it kind of fell through the tracks. I finally received my Kickstarter copy during the deluge that was the summer and with so many other games coming out, it kind of vanished into the game closet. There’s something really interesting in this game and it does look really good, so I have to make sure it’ll hit the table soon. Tragedy Looper (ZMan Games) by BakaFire: There are a lot of games coming out of Japan lately and most of them seem to have that little twist that make me sit up and notice. Sometimes, while the game is quirky, it doesn’t end up being all that good while some of the time, the quirk is simply the first step towards being truly interesting. Tragedy Looper is certainly a game that seems to bring both quirk and true interest to the forefront. In Tragedy Loopers, the players are divided into two groups: a mastermind, who will be running the game, attempting to get certain events to come to pass; and 1-3 protagonists who oppose the mastermind and will attempt to try and prevent the events from taking place. The Looper part of the title has to do with the fact that the players will go through the same day multiple times, attempting to deduce what roles the different characters have in the entire affair. This game has been described to me as a cross between Mastermind, the classic game of deduction, and a pseudo-rpg. As the players move the different characters around the board, different events can be triggered, thus bringing the Tragedy closer to taking place. Very intriguing stuff. Why hasn’t it hit the table? Well, it got close 4-5 times and I simply ran out of time. Again, this is one that has a reputation of being difficult at first, not because of the rulebook but rather because of its very different premise. Honestly, the rules don’t look all that hard to wrap your head around, but the card art is what bothers me the most, with the very dark background. The game does intrigue me and there’s enough interest in my groups that I’m pretty sure it’ll hit the table soon. So, what are we waiting for? If you attend one of the events that I regularly attend, hit me up for one of these. I’ll be more than happy to play them and hopefully finally enjoy them, or worse case quickly find a new home for them!